Anyone who is working with kids knows they have the attention span of a puppy at a dog beach. They mindlessly hover in between ideas, migrating from event to event, trying to be as hilarious and surprising as possible. What they don’t realize is that readers value structure and a little bit of predictability. Kids do not realize this truth about structure because they, themselves, have not yet learned to identify the structure in a story, which is why, after identifying the components of a story, I’ve chosen to teach the identification of overall story structure. When I was talking to some other writers and teachers about this, they asked me if I would be teaching about subplots and other complex story elements when teaching structure, and the fact of the matter is: you just can’t. Simple plot structure is going to be confusing enough, and what’s more important is that you set plausible and attainable expectations that can be met through concrete activities. It’s also important to recognize that they will not be able to write stories at the level of stories they can comprehend. Instead, they will be creating stories at a reading level several grade levels below their respective comprehension levels. Since creation is high on Bloom’s Taxonomy, it is only natural to expect that they will be creating something only after they are able to identify and analyze it. They simply aren’t ready to fully analyze text at their comprehension level yet, making it very difficult to, then, produce a story of that caliber. 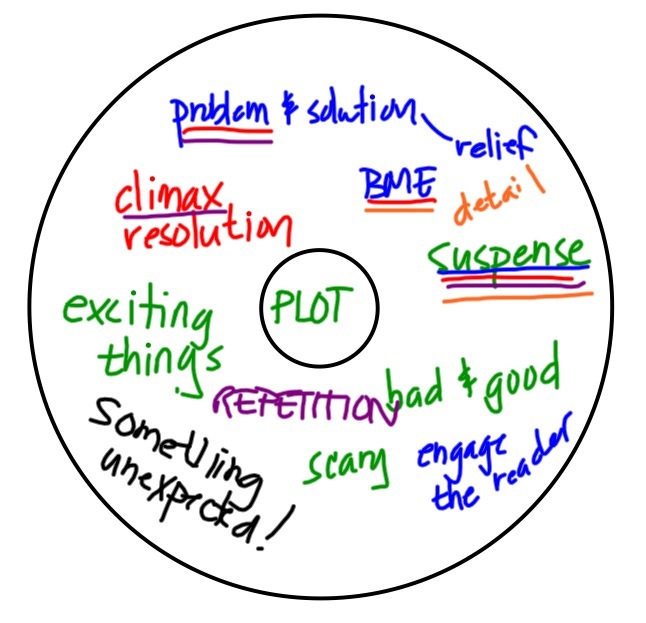 Of course, prior to teaching students how to write a plot with a strong structure, it is necessary to teach them how to identify that plot structure within stories. For my students, I used Gooney Bird Greene, since we were reading that the week prior to look at the characteristics of a good story. By using the text, we were able to take several of the main character, Gooney Bird’s, stories and dissect them for exposition, rising action, climax, falling action, and resolution. 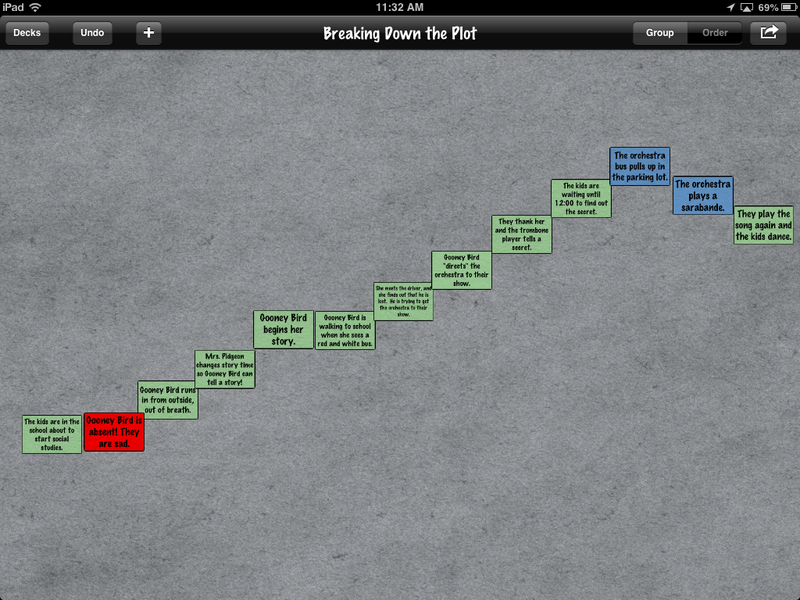 I began by modeling this process, showing them how to identify each part of the plot structure. We used the iPad app iCardSort, mostly in an effort to make this more visual and manipulatory. Plot structure is difficult, not only because it requires an analytical knowledge of stories, but also because it requires big-picture thinking, which most nine-year-olds are struggling with. So, as we read the story, we created event cards. We lined these event cards up, in order, as we went through the story, placing each card above or below the next to show a heightening in the plot (suspense, excitement). When we felt like we reached the climax, we placed the cards in a downward trajectory, showing a progression towards the resolution. The end result not only showed that the students could identify the plot structure, but it also proved to be a conduit for critical thinking and concrete learning. Instead of having the events written on paper, students were able to literally manipulate the events to create a visual representation for the story, while asking questions like “Is this the climax?” or “Should this event be above or below?” This paved the way for interesting conversation and discussions about how the author used certain events to build suspense and excitement within a story. Research and many best practice academic texts prove that it is essential for children to identify examples of proficient writing prior to attempting creating their own. This second part of “What is a Story?” provides this critical step in the writing process. Next time, I will share with you the actual construction of a plot. Looking forward to seeing you back here! Prev Teaching Fiction Writing: What is a Story?